If you find yourself reminiscing about the days when you could actually park your car in the garage, it may be time to build a shed. An outdoor shed is an attractive and convenient way to store things that accumulate and clutter up your garage or basement. Perhaps you just want a place to store your tools – maybe even a workshop to use them in. The point is, an outdoor shed can be as versatile as you want it to be. It’s the versatility of sheds brings us to our first point: Before even building or buying your shed, spend some time going over what you’d like your shed to do for you. Is it going to simply be a place to store your tools and equipment? Are you going to work in it? How much wall space for tool storage is needed? If you need to put in a workbench, not all layouts will work. How important is the look of the shed? Do you need it to tie in with your garage and house décor? The next thing to think about is whether or not there are any building restrictions where you live regarding outdoor structures. This will need to be taken into consideration as you determine the size of the shed, whether it will have electricity or not, or what type of foundation suits your needs. Some communities have restrictions on how far from the neighboring property line your shed can be placed, as well as how tall it is. Areas prone to hurricanes and tornadoes may have further construction requirements. 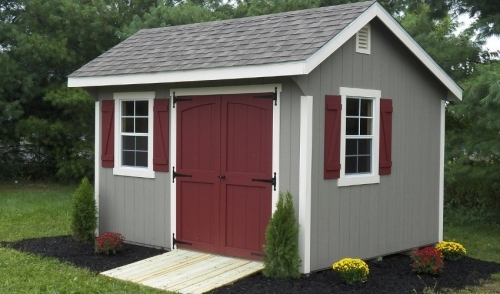 Make sure to choose a spot that will compliment your shed’s main purpose. For example, a garden shed should be placed near your garden, a pool shed near the pool, etc. Take notice of nearby trees and plan accordingly in relation to future growth of root systems and how they can affect your shed’s foundation. It is also important to note that a shed needs room to breathe. Try to keep at least three feet of space around the outside for air flow. Lack of sunlight and air movement will leave your shed damp, which will promote mold, mildew and rot. Next, we’ll discuss the various components that will make up your new shed and the different things to consider for your situation. Whether you decide to build your own shed or go with a pre-built one, you will still need a foundation. A solid foundation made out of quality materials will last for many years. If you decide to use wood, make sure to select pressure treated lumber wherever there is soil contact. There are advantages and disadvantages for each type of foundation. Concrete will last a long time, but you won’t be able to move the shed from that spot if you need to. A wood foundation made up of skids is more mobile if need be. Floor choices also have their different advantages. Above all, your floor should be rot-proof and protected from excess moisture. A concrete foundation can also serve as the floor, which can save time and production materials. In many cases, a plywood floor will suffice; though consider pressure treated plywood to better combat moisture related damage. If you will be putting away equipment that is wet or will be dripping on the floor, a gravel or paving stone floor would be a good choice. You could rinse the floor with a hose and the water would drain away, though the stones. If you intend to hang a lot of tools, you should choose carefully when placing windows. If you intend to spend more time in the shed, using it as a workshop, windows can supply much needed ambient light. Skylights are also a wise choice for this reason – they supply light without sacrificing wall space. Also choosing whether or not to have electricity can affect the number of windows you will depend on for light. If you decide to build your own shed, buying pre-assembled roof trusses can save a lot of time. In fact, if you were to cost out the lumber and materials to build your own trusses, you’d see that pre-built ones cost only a few dollars more. Most sheds use asphalt shingles, which are fine, but keep in mind that corrugated metal roofing can be an excellent upgrade. Though the cost of metal roofing is higher than asphalt, the relatively small square footage needed (compared to houses and garages, etc.) and ease of installation makes it a compelling alternative. Metal roofing can last for decades and excels in climates prone to snow. There a lot of things to think about, as you can see. Once you become clear on what you are looking for in a shed, making it happen is where we come in. We will help you every step of the way, whether you decide on a prebuilt or want to build your own. Our staff will be ready with suggestions that will ensure your shed is exactly what you’re looking for. Also, don’t forget we’ve got all of the paints, stains and moldings you’ll need to tie everything together and make your new shed fit right in.